Windowframe is an investigation of the way in which we may perceive a specific image - that of two people, seen through a window, involved in some activity. This is the image seen at the opening of the film. Subsequent sections of the film present to the viewer differing juxtapositions of the four segments of this image which are created by the cross-bars of the window. Tensions are created between what we expect to see and what we do see. We see the original image as a single whole. Do we perceive the manipulated sections in the same way, or are we drawn to investigate each pane separately? Can we make ourselves see the manipulated sections in the same way we see the original sequence? In the section in which the image is split simply horizontally or vertically are we able to re-establish/re-construct the original image in our minds so that the image we see differs from that on the, screen? Perhaps this film answers some of these questions; perhaps it merely raises them. For the best part of ten years 'Windowframe' was exhibited as a silent film. I had, however, always 'seen' it as a film with sound. Indeed a magnetic stripe to facilitate this had been added to the original print of the film at the lab. However, I was unable to decide exactly what the soundtrack should be. A simple music track seemed inappropriate, too much like background music for its own sake with little relationship to the structure of the visuals, whilst attempts at a more constructed rhythmic track introduced extraneous 'off-screen' information taking the viewer outside of the experience of simply watching the film itself. I was looking for a soundtrack that provided an equivalence for the visuals themselves. The soundtrack on the existing print is the 'Missa Pange Lingua' by Josquin des Pres. It was combined with the visuals in 1982. This music was in fact recorded for a later film. During the editing of this film I became interested in the 'out-takes', where singers had made mistakes injecting sudden interruptions in the four-part medieval harmonies. Not only did the religious music resonate the stained glass quality of the 'Windowframe' images, but also the four-part structure and its interruptions provided the auditory equivalence for the overall structure of the film. Note prepared for Shoot, Shoot, Shoot Programme, Tate Modern, 2002. 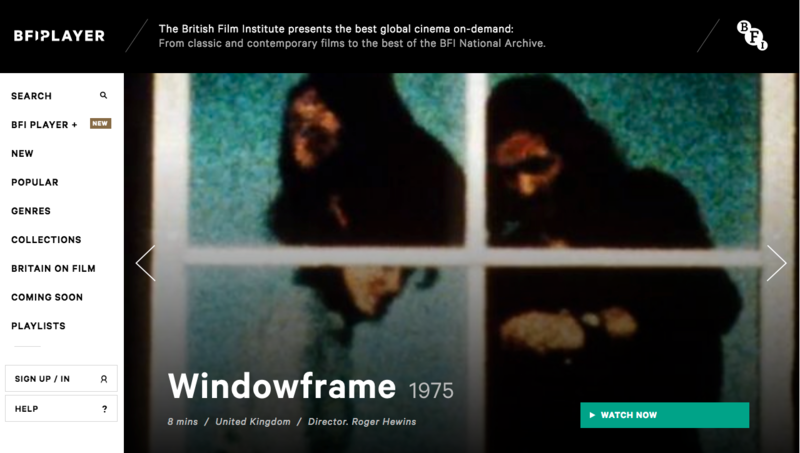 Windowframe by Roger Hewins closed the program. This film, from 1976, felt very 70s to me. That's a compliment! Using the four quadrants of a window frame as a canvas, Hewins reprints sequences and parts of sequences of a man and a woman engaging in some mundane activity with shells and other objects. The slowing down and the repetition and the disjunction when parts of the figures are "decapitated" by other images in the above quadrant make it completely engaging. The pace is not dizzying, as in other films that employ an optically printed collage, so the viewer is clearly focused on the simple arc of movements between these two people. The soundtrack is "Missa Pange Lingua'" by Josquin des Pres, but not a complete polished performance. Hewins includes mistakes and commentary by the singers, which disrupts the flow of the music (much like he disrupts the flow of the images through optical printing), and gives it a feeling that's casual, almost folksy.